Installation was completed on the world's largest radio telescope on Sunday morning as the last of 4,450 panels was fitted into the center of the big dish. Hoisting of the last triangular panel to the reflector, which is the size of 30 football fields, began at 10:47 a.m. and lasted about an hour. It was a landmark step for the telescope's planned launch of operations in September. Radio telescopes have made major astronomical discoveries, such as pulsars, quasars and cosmic microwave background radiation. Among the 10 Nobel Prizes in physics awarded for discoveries related to cosmology and space, six were attributed to radio telescopes. "As the world's largest single aperture telescope located at an extremely radio-quiet site, its scientific impact on astronomy will be extraordinary, and it will certainly revolutionize other areas of the natural sciences," said Nan Rendong, chief scientist with the FAST Project. FAST will enable astronomers to get a jump-start on many scientific goals, including surveying neutral hydrogen in distant galaxies and detecting faint pulsars. Scientists also expect breakthroughs on pulsars, the highly magnetized, rotating neutron stars that emit a beam of electromagnetic radiation. So far more than 2,000 pulsars have been detected. "Pulsars can help scientists study gravitational waves," Chen added. As China joins international efforts in gravitational wave detection, FAST will help improve the chances of detecting low frequency gravitational waves, said Wu Xiangping, an academician of the Chinese Academy of Sciences, who predicted great breakthroughs in this area in the years ahead. For ordinary people, perhaps the most exciting goal of FAST is the search for alien life. In two or three years, scientists could find amino acids, the foundation block of life. There is a great chance that people will someday find life on other planets or galaxies, said Li Di, an NAO researcher. "FAST's potential to discover an alien civilization will be 5 to 10 times that of current equipment, as it can see farther and darker planets," said Peng Bo. It has been more than two decades since Chinese scientists proposed building FAST in Guizhou. In 1994, site surveying started on geo-morphological features and the distribution of karst depressions, climate, engineering environment, social environment, and radio interference. Engineer Zhu Boqin worked on the site selection 20 years ago. He recalled that after more than two hours trudging on the rugged mountain road, about 150 kilometers south of the provincial capital Guiyang, he was impressed by the sight of a large, round depression embraced by verdant hills. It was home to 65 people from 12 families in a closed-off world called "Green Water Village." Lacking electricity, the villagers had a clear view of the starlit sky at night. Zhu said that though the villagers did not understand the radio telescope, they were excited when scientists explained that they would use it to search for intelligent beings on other planets. Formed by the dissolution of soluble rocks, such as limestone, dolomite, and gypsum, the karst formations create naturally spherical depressions. This saved efforts in digging hollows for the dish, said Li Di. The three hills around the depression formed an equilateral triangle, creating a perfect holder for the dish, Li said. The karst formation is also good for draining rainwater and protecting the reflector, Zhu said. Moreover, the surrounding area has "radio silence" as there are no towns within a 5-km radius, and only one county seat within 25 km. The site was eventually chosen for the FAST Project. Residents were moved away to towns in 2009, where they enjoy better living standards. Villagers in nearby communities admired their luck, saying they should "thank the aliens." "I never thought the first time I would move would be to make way for a telescope," said Yang Chaolan, 62, who now lives in a government-funded two-story building in the seat of Kedu Township. Her son, Yang Tianyou, 29, plans to open a restaurant or supermarket in hopes that growing tourism will bring him fortune. 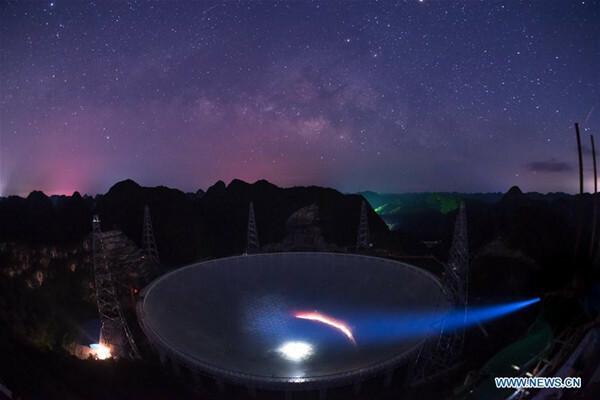 According to a government plan, 9,110 residents living within five kilometers of the telescope will be resettled in Pingtang County and Luodian County in four settlements by the end of September.